The world's first mechanical lawn mower was built by J R and A Ransomes of Ipswich in 1832 to a design by Edwin Budding (1796-1846) of Stroud. 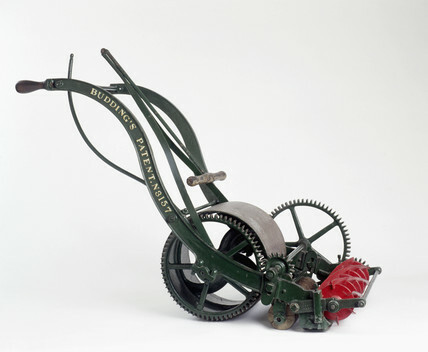 The lawn mower shown here is one of the earliest machines made by the company. Spur gears connect its main roller to the knife blades, rotating them at 12 times the speed of the roller. Budding patented his design in 1830, basing his gras-cutting machine on the shears used for trimming woollen cloth in textile factories in his native Gloucestershire.